Illuminate any home or office with fresh, fragrant stargazer lilies. Accented with statice and poised in a clear glass cube vase, it's a picture perfect arrangement for birthdays, anniversaries, get well, housewarming or just because. Standard Arrangement Measures 10" x 12". Pink Lily Bouquet is a hand delivered gift. These gifts are delivered by one of our local design centers located throughout the United States and Canada. Same day delivery is available for most gifts when ordered before the cutoff time. 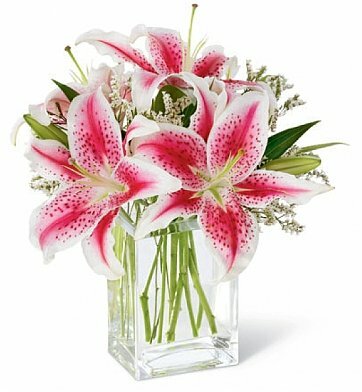 The cutoff time for Pink Lily Bouquet is 2 PM in the recipient's time zone. Very Pretty Flower arrangement at affordable price. I can recommend you to friends. You have beautiful flower arrangenments at affordable price and very reliable too. No hidden cost. My Mom loved the flowers and it was so easy to order and pay. She really loved the gift, says they smell amazing, and the balloon and bear are cute. I wasn't able to choose the balloon and bear, but I agree with what y'all thought of. Thank you! Sent to our daughter. The flowers are still beautiful one week later. Thanks. Ordered these flowers for her birthday, arrived on time (in fact, they even called to make sure someone was there). She loved, and sent me a picture. They were beautiful. The picture does not give them justice. I got my girlfriend her favorite flowers as a surprise. She absolutely loved them! her friends and family raved about how beautiful they were. I saw them a few days later and they still looked great! 3.5 stars. I bought premium option. Lily's look exactly like on the photo, they are huge and look really nice when they open up. But for premium option it was only 6 of them. They come in very short vase (meaning lilly's are cut very very short) with lots of greens. It is practically impossible to change the water after a while, since there is green piece of string made like a mash on the top of the vase. I also got bunch of balloons, which are not identical like on the photo. There is no plain balloons, they all have sign happy birthday on them...so when you get bunch of 5, it is just too much. Beautiful and smell so good! Got theses from my family for my birthday. Beautiful! And jist the right size. The flowers are still beautiful after more than a week and I love how I can smell them when I walk in the house!